Anton Skrabl of Slovenia has a world wide reputation for building organs. The one in Lyme Regis Parish Church is an excellent example of his work and one of the best organs in the South West of England. Lyme’s organ has been beautifully decorated by local artist David West. 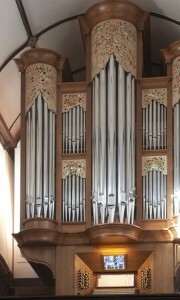 At 2.30pm on Tuesday 19th March, Richard Godfrey of the Lyme Regis Organ School will give a talk in the church about the building, installation and playing of this wonderful instrument. Entry by donation to the Organ Appeal.